Wildlands Conservation will be holding its next Gopher Tortoise Authorized Agent Training January 13-16th in Venice Florida. Please email Lance Arvidson if you are interested in attending. 2 DAYS (1 Day Classroom, 1 Day Field). Pre-class and post-class work is needed to pass this course. 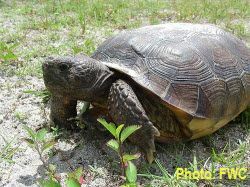 Wildlands Conservation is offering an intensive 4 day class that will combine Course 1-A and 1-B for those that desire to be trained in Gopher Tortoise Surveys, Transport, Marking, Release, and Capture (Does NOT include Mechanical Excavation class ). 4 DAYS (2 Days Classroom, 2 Days Field). It also covers basic natural history, safety issues, recipient site management and FWC Guidelines and Permitting Requirements. Pre-class and post-class work is needed to pass this course.